Now Stay updatedFeel the love and let soulful conversations take over with your loved one. Listen to the full song audio of Dil Diyan Gallan from the film Tiger Zinda Hai. 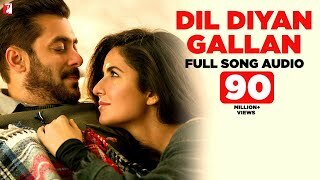 Song CreditsSong Dil Diyan GallanSinger Atif AslamMusic Vishal and ShekharLyrics Irshad Kamil Dil Diyan Gallan Song Swag Se Swagat Song Tiger Zinda Hai Trailer Stay in the filmy loop Like us on TigerZindaHai Follow us on Twitter Follow us on Instagram tigerzindahai Movie CreditsStarring Salman Khan and Katrina KaifDirected by Ali Abbas ZafarProduced by Aditya ChopraMusic Vishal and ShekharRelease Date 22 December 2017SynopsisInspired by real events, Tiger Zinda Hai is a sequel to the blockbuster Ek Tha Tiger, and an espionage action drama that follows a daring rescue mission in Iraq. When a group of Indian and Pakistani nurses are held hostage in Iraq by the militant Abu Usman, Indian intelligence RAW tracks down the reclusive agent Tiger 8 years after he fled with former Pakistani intelligence ISI agent Zoya. Joining forces in the name of humanity, Tiger and Zoya lead a team of RAW and ISI agents to covertly enter the hospital where the nurses are trapped, and get the nurses to safety before an American airstrike blows up the hospital. Tiger Zinda Hai is an all-out entertainer with gritty action, music and drama.